Implant-supported crowns are a natural-looking and stable replacement for a missing tooth. Once a trusted surgeon in the area has placed your dental implant, Dr. Jon Marc Van Slate will design and fit your customized restoration at our Houston, TX, practice. We offer premium-quality crowns fashioned at an American lab for a lasting, seamlessly restored smile. Dr. Van Slate is passionate about providing the best dental care, not just what insurance companies decide to cover. To help you afford premium treatment, we offer CareCredit and Lending Club financing to help patients afford the treatment that best serves their health. 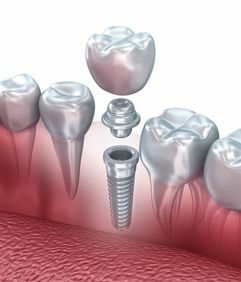 What is an Implant-Supported Crown? An implant-supported crown is a single dental crown supported by a dental implant, designed for patients looking for a permanent and lasting solution to replacing a single missing tooth. During the procedure, the oral surgeon will surgically insert a small titanium post into the jawbone to replace the lost tooth roots. In about four to six months, once you have fully healed and the implant has successfully fused with your jawbone, Dr. Van Slate will design a dental crown to affix over the implant. This restoration will be custom-made to blend with the natural shape, size, and color of your neighboring teeth to not only restore dental function but also a beautiful smile. The restorations used by Dr. Van Slate are fashioned at one of the best labs in the United States in order to provide a high-quality product with a customized fit. When choosing a dentist, it’s important to know where your restoration will be made. Many dental practices work with overseas labs that provide cheaper restorations and deliver inferior results. When tooth loss is left unaddressed, even for just one tooth, it can lead to serious oral conditions, such as shifting teeth, dental pain, jawbone deterioration, and structural changes to the face. This is why it is important to immediately choose a restoration once tooth loss occurs. In the past when tooth loss occurred, the only option was traditional dental bridges. This type of restoration is designed from a single block of porcelain and consists of a false tooth in the middle with a dental crown on either side. The two crowns are bonded to your remaining teeth for support. Although traditional dental bridges are a faster and more affordable treatment option, implant-supported crowns provide a longer-lasting approach to restoring your smile without altering neighboring teeth. It is also important to understand that the bone tissue will recede in the absence of tooth roots. A traditional bridge cannot stop this from happening, but a dental implant can. Are you looking for a permanent option to restore your smile and improve your dental function after experiencing tooth loss? Contact us online today or call (713) 783-1993 to schedule your consultation with Dr. Van Slate.